We all have the same amount of time in the day. What we do with our time is our choice. Yes, we need to make an income, we have to cook, clean, take care of the house and there are things that have to be done in our lives, but ultimately, we have a choice over a lot of it. Having time or finding time are excuses. If you want to do something or have a strong desire to get it done you will make the time. People are shocked by how much I get done. 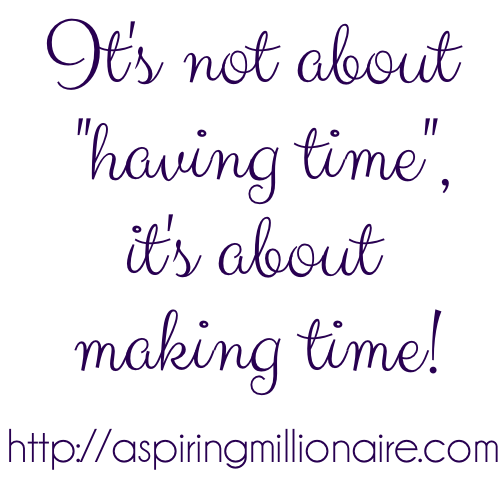 I often get asked how I find the time to do it all or people will say I must have a lot of time to do it. I don't. I just prioritise and do what needs to be done and what is important. I have created my lifestyle. It has taken work and a lot of trial and error to get the balance I have now. It has not been easy and it isn't always easy. I am a single parent of 2 children with extra needs, growing my business and trying to give my kids the best life I can. How do you make more time? 1.) Lose the TV or at least limit it. I cut TV a few years ago. I do occasionally watch some shows, but there is not a show I consider a must see, a series I watch all of or anything like that. In fact, for the first few months of living in Canberra, after I bought a new Smart TV, it sat in the box. Cutting out TV does wonders for your time, for the desire to buy new stuff and for your kids as well. 3.) Outsource. Work out what you can outsource and do it. I have staff writers for a few sites, I have someone who manages most of my advertising, I have a babysitter I can call on a lot. I am looking at getting a gardener and potentially a cleaner. The hours it takes me to do those things are better spent working on my business. 4.) Decide what is important. My daughters are the most important thing to me, as is our health. Followed by my business and extended family. Everything else comes after these. Knowing what is important to me and what I value enables me to make decisions quickly about many things, based on if it is beneficial to the things that are important to me or not. 5.) Have goals. Goals keep you focused and help stop you wasting time if you are actively working towards achieving them. Not sure how to set, stick to and achieve goals? Check out 10 steps for success with goals. And if you want to see my goals, click here. 6.) Set time limits. It is easy to get lost on social media and waste hours. Set time limits for how long you will do certain tasks. I apply this to everything from cleaning to writing. I set alarms so I know when to stop and I do. I stick to my time limits. 7.) Focus on one thing at a time. When I am scheduling social media, that is all I am doing. When I check my email, I focus on just doing that. I set a specific time for email and leave it at that. I took notifications off my phone so I wouldn't be wasting time checking emails or social media. Be focused and set time for the things you need to do. 8.) Have rewards. Life is no fun if it is all work and no play. If there is a TV show you love, watch it. If you want to go on holiday, plan for it and do it. Reward yourself for achieving goals, being productive and sticking to things. Absolutely correct. We all have the same amount of time, and its funny how some people manage to fit so much in. Its all about the way you live your life and how you decide to tackle everything. Yes, it is about the way you live your life. You're right on, it's all about priorities. You will make time if it's important enough to you. Exactly, I think too many of us have our priorities mixed up. Exactly. It is about priorities, what you want in your life and what you will do to make that happen. Time limits are essential. I know if I don't set limits my children suffer. Cutting out TV and wasting time on social media is what I do to make sure I have enough time for everything I need to do. It's probably where many people waste their day away. I'm also pretty good at setting time limits for things, now I only have to get better at prioritizing what's really important to me!